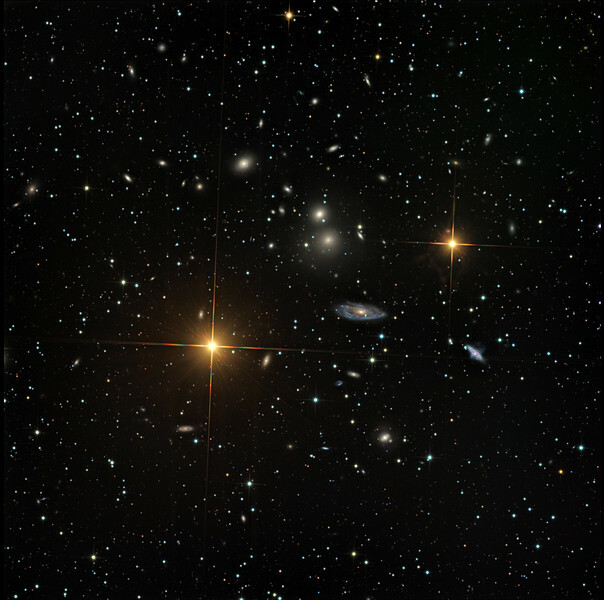 The central core of rich glaxy cluster Abell 1060, There are at least 224 clearly identifiable galaxies in this image. Luminance 14.5 hrs, RGB 2.5 hrs each. Aspen CG16M on 20 inch PlaneWave. Far toward 4 o'clock is the visually overlapping but unrelated pair of galaxies NGC 3314, showing that galaxies are translucent. Between the two very bright stars is NGC 3312, a distorted spiral with much star formation in the spiral arms.